We are proud to announce that the Pittsburgh Business Show was just announced on the Pittsburgh Business Times Book of Lists as the 18th largest public event in Pittsburgh and the numbers keep growing year after year. With only six more months to go until the kick off of the 2019 Pittsburgh Business Show, spaces are filling up fast! As the largest business for business trade show, conference, and networking event in Pittsburgh, demand for exhibitor space is at an all-time high, leaving limited space available for the show. Many exhibitors of the last two years have locked in their third year, and ultimately some of the industries are already sold out. With over one hundred thousand square feet of exhibitor space, over 160 exhibitors and almost 3000 attendees last year, join this one of a kind event where you can connect with a diverse crowd of attendees and exhibitors. From business owners and CEOs to operations, administrative support and business development professionals, you can make connections that will help you grow your brand and establish helpful business partnerships and relationships that will help your business grow and thrive beyond the show. Our exhibitors are limited by industry, and we allow only up to five exhibitors per category. Unlike other events where you are one of many in your category, our goal is to create a partnership with like-minded, well-established businesses that are looking to do serious business and grow year after year. This exclusivity provides you with an opportunity to be one of five exhibitors in your category, helping to reduce industry competition and provide you with the opportunity to focus on connecting with potential customers and work with the other businesses who are partners of the Pittsburgh Business Show in a referral network atmosphere. When you become an exhibitor for the Pittsburgh Business Show, you will not only benefit from the opportunities at the show, but you will also receive additional marketing and media exposure throughout the year through our website, social media, press releases, business spotlights and more! Secure Your Spot for the 2019 Show Today! With limited space available for the 2019 show, we are recommending that you register your booth as soon as possible to ensure your business is represented and has the opportunity to participate in the Pittsburgh Business Show. Registration for booths can be completed on the Pittsburgh Business Show website and special pricing for potential speakers, partners and sponsorships are available. Don’t miss out on this one-of-a-kind opportunity to showcase what your business has to offer! 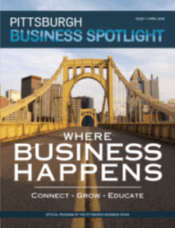 For more information, please contact the sales team at info@pittsburghbusinessshow.com.